The International Standards Organization is probably most famous for ISO9001, which defines Industrial Quality Management standards, and ISO14001, which is central to Environmental Management Systems. Sure, you can build a manufacturing facility without complying with these standards, but you probably wouldn’t have any customers—they not only are models for best practices, but have become market expectations in industrial markets all over the world. ISO14001, for example, was released in the mid-90’s, and spread to 25,000 sites in the first 6 years alone…today, that standard is applied to well over 300,000 sites . The way these standards spread across the globe follow a very similar pattern: adoption starts in Europe and Asia, where governments create incentives or laws to stimulate compliance. Since many large U.S.corporations have operations in those continents, they have to comply for the plants in those regions…and the seed is planted. Soon enough, those U.S.corporations seek to extend the benefits of compliance across their enterprise also requiring their suppliers to comply and further influencing the rest of the value chain. 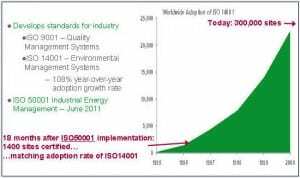 ISO50001, entitled “Energy management systems — Requirements with guidance for use”, was only released 19 months ago, but is already showing signs of this same explosive growth pattern. As of the end of January 2013, 1400 sites have achieved certification, which matches the early adoption rate of ISO14001. What isn’t representative in this statistic; however, are the hundreds if not thousands of sites implementing the standard without pursuing certification. This is because the standard, even without the certification status, gives credibility and structure to an Energy Management initiative adopted within an industrial process facility, saving energy cost, reducing downtime, improving energy reliability, and contributing to Sustainability Strategy. Whether seeking certification or not, early adopters of ISO50001 are well poised to leverage a competitive advantage as this standard quickly spreads and sets the bar for process energy efficiency and sustainability strategy worldwide. More can be learned about the standard at the ISO website. If you’re ready for implementation, there’s a great 3-day course that goes over all of the details. To industrial end users in the US: Are you familiar with ISO50001 already? If so, are you starting ISO50001 compliance initiatives yet? Very nice introduction on the topic of ISO standards especially the one’s that can help drive customers business that we can help with. Thanks, Tim! When I look at the list of companies who are implementing the standard in Europe and Asia, I see a lot of familiar brands: these same companies have operations here in the US. And, I see familiar US companies with operations overseas, so it’s easy to see how these standards can spread. 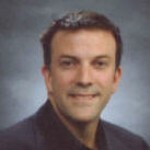 Hi Robb, you may want to look into the typo in the “ISO 140001” stated in the first paragraph of your post. It should read “ISO 14001” less 1 zero. Thank you for catching that! By the way, I’ve spoken with end users to say that there are several aspects of ISO14001 that they can re-use in implementing ISO50001, such as documentation systems and communication policies. Taking advantage of these existing resources simplifies compliance projects. Do you have any other examples of what can be re-used from ISO14001? I think another key reason to implement for industrials is the ability to impact process. Most energy efficiency projects focus on the ancillary equipment and “don’t mess with process”. At the first few Schneider plants to implement 50001, we are able to drive efficiency gains on our Paint Line by having the platform to engage with the process experts. That’s a good point, Wade. While there are other standards out there that address the physical characteristics of the building, such as LEED, one of the ways that the ISO standard adds value is that it addresses the manufacturing processes within the building…in other words, how does one use the equipment in an energy efficienct and sustainable way? In your Paint Line example, what was changed within the operating procedures? Another great aspect of ISO 50001 is its ability to talk the same ISO Language as other systems. Production team members will be familiar with the general requirements and structure of an ISO system, due to their familiarity with 9001 and other quality systems. Money can also be saved by integrating with 14001. A systematic approach to energy management is necessary, especially after low hanging fruit has been picked. Great article and valuable white paper. Well done! I totally agree, Bill: We also find that the end users that are ‘process-minded’ have the culture and support infrustructure that makes adoption of such standards more simple and successful. As Publisher of “Energy Management Insider”, what evidence have you seen that supports the growing interest in ISO50001? Nice sumup: as Energy Roadmap consultant in Schneider France, when I propose the implementation of ISO 50001, customers appreciate a lot that this is the opportunity to have 360° action plans on energy uses: not only technical aspects but change management issues too ! You’re right, Geoffory, there’s a lot to be gained from the ISO 50001 standard, even if ‘official’ certifiation is not pursued: companies recognize it as a blueprint for an Energy Efficiency initiative that their whole organization can embrace. The ISO 50001 Standard establishes a framework for energy management in which planning, goal setting, benchmarking, and continual improvement are the focus. It provides a systematic approach to energy management that is founded upon the most successful training principles and actual programs. Those industrial operations that do not have a strong strategic energy plan and program in place would be well served to consider ISO50001 as a framework for their future energy management initiatives.